River Oaks Italian trattoria still playful and special after all these years. : La Grig, as regulars call it, has long been a mainstay of the Houston restaurant scene, although at night, it draws a younger, hipper crowd. 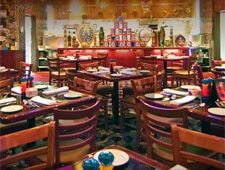 The brightly colored trattoria, with food-themed wall murals and colored glass accents, makes for a lively and comfortable setting for the Italian fare. Consider starting with a bottle of Twin Islands Sauvignon Blanc paired with a thin, Roman-style pizza topped with roasted chicken. From there, move on to a pasta or seafood dish. Linguine with clams is quite good, as is the duck confit ravioli. And the grilled baby Coho salmon with crispy artichokes is a winner, too, as are the braised short ribs. An extensive wine list, heavy on Italian offerings, and a full bar serving classic cocktails round out the menu. A pulsating Monday through Friday happy hour features cocktail and wine specials in the bar and on the patio.